McMurray Musings: "The Wall", "Mac Attack", and "Dried Roses" - winter"PLAYS"
"The Wall", "Mac Attack", and "Dried Roses" - winter"PLAYS"
I returned home from my Teacher's Convention vacation rested, relaxed, and ready to dive back into all the fun that is Fort McMurray. Unfortunately I also came home sick, bringing with me a lovely cold caught in the mountains (and like all mountain creatures this appears to be one tenacious little critter). 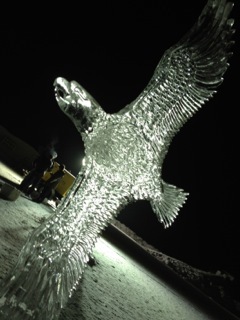 This explains the delay in this blog post review of the final day I spent at winterPLAY. It certainly isn't that I didn't want to review what I think was the beginning of an amazing new adventure in Fort Mac entertainment. Nope, I just didn't want to keep sneezing on my computer screen! So, today, loaded up with cold medication (and thus giving myself an easy excuse for any bad language, grammar, or spelling - hey, I'm high on cold drugs, people! ), I sit down to write about the last Saturday at winterPLAY - and about what I think the new evolution of this festival means to us. On Saturday I headed down to the Snye at about 1 pm, coffee in hand, and discovered parking was difficult. Real difficult. In fact I had to park quite a distance away, at what appeared to be a snowmobile launch point, but I was okay with that as it meant lots of people were enjoying the winterPLAY festivities. I got out of my car and was mildly disturbed that I was now parked on a frozen river, and walking on it, too (I'm a bit nervous about things like that, always expecting that if the ice should crack it would naturally do so under me). I wandered over to the tents, and the first thing I saw was the snow block maze, which was pretty cool and appeared to be crawling with children (I'd cleverly left mine at home, lounging in their pyjamas and watching YouTube after their exhausting mountain holiday of...watching YouTube). 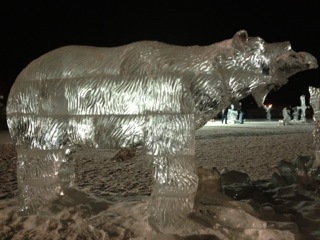 And I spotted the ice slide, and then the ice carvings. 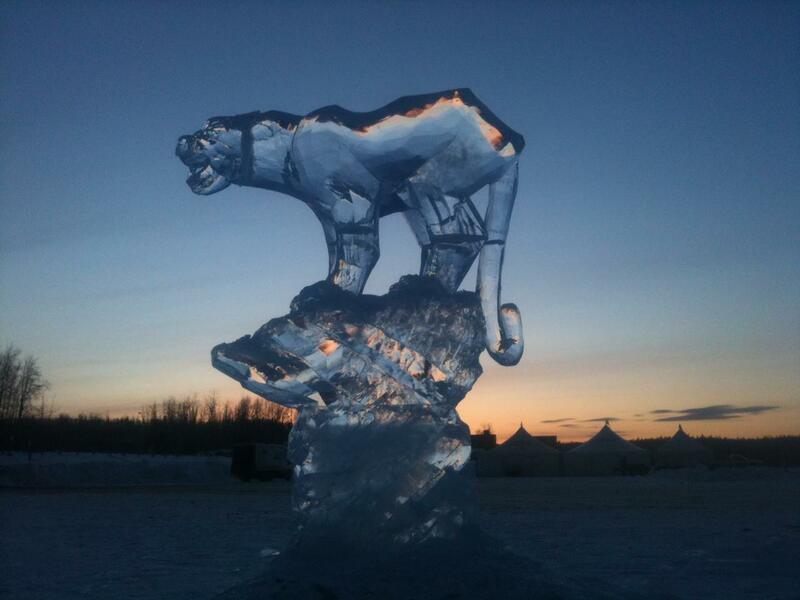 Oh, those ice carvings! I took some photos of them but my photos turned out rather poorly, the sun reflecting off all that shiny ice, I think (yes, that's my excuse, I wasn't taking any cold medications at that point). So, I borrowed a photo from the Events Wood Buffalo Facebook page, and my friend Rolando shared his so I could share them with you. If you didn't see them then you truly missed artistry in ice. 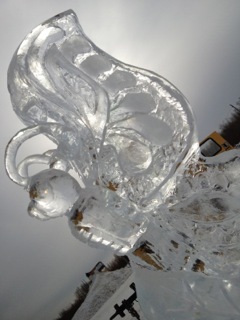 There is something so beautiful about ice carving, about the intricate details in a form of art destined to succumb to the elements. Here today, gone tomorrow when the sun shines and all those intricate cuts into the ice become nothing but rivulets of water (cold medication, people, it always makes me all poetic). Once I'd finished admiring the ice carvings I headed for what I had truly come for - the Cabaret Tent, where I would see three plays from some of my very favourite Fort Mac creative people. Before I talk about the plays I do need to make some comments on the tent. It was nice and warm, with fans blowing warm air. It had a bar, which I didn't use as it was 1 pm and I was driving, too. It was also entirely too noisy for the plays, and that was the only disappointing part. Between the noise from the blowing fans, the adjacent outdoor stage where live music was being played, the patrons who had come for the bar and not the plays, and the occasional snowmobile noise off the river, it was a very distracting environment for both the audience, and, I suspect, the actors. For two of the plays the noise was tolerable and you could still hear the dialogue - but for one of the plays it was truly disappointing, and I feel like I missed out on something very special because of it. Let's start at the beginning, though. The first play was "The Wall", written by Francis Meningke. Francis also starred in the play along with Rebecca John, and the play was directed by Michael Beamish of Eye Flower Productions. These names might seem familiar to you, people, as I've written about them before when I went to a "house play" called "Legion Blues" (yes, a play staged in a house) late last year. That's when I discovered Francis, Rebecca, and Michael, and was pretty much blown away by their talent. So, when Francis and Rebecca took the stage for "The Wall" at winterPLAY I was delighted and hoping for great things - and I was not disappointed. "The Wall" is a lovely piece, much like a tribal story handed down from generation to generation, a traditional oral tale of a "primitive" society that meets a technological one when technology breaks through "the wall". Beautifully written and acted, I particularly loved watching Francis turn on a dime to switch characters, and the way he delineated the characters by verbalizing very specific traits so you knew which character he was (tough to explain, but amazing to see). With nothing but four tires, their voices, and their bodies, Francis and Rebecca told the tale Francis had written, and did it with perfection. I was thrilled (and amazed by Francis' hair - who can resist that crazy wild hair of his?!? ), and I can tell you this - any future plays they do I plan to be there, front and centre. Frankly, I'm crazy about them. The next play was Michael Beamish's own "Mac Attack", starring Michael and fellow actor Ian Stockley, who I had not seen before. Now, "Mac Attack" is very different from the "The Wall" as it is very much about the modern world - and conspiracy theories, the end of the world, nuclear warfare, and the Illuminati. You see, Michael's character, "Teevo", has scoured the internet and learned that the Illuminati is behind everything, and the end of the world is imminent. So, he has constructed a bunker and filled it with all the necessities of life for the next hundred years - and convinced his friend Darrell to join him in the bunker. The play is hilarious, without a doubt, leaving me roaring with laughter at points when they work on a constitution for their new society of two, and when they develop a bartering system that quickly goes wrong. It seems you can build a bunker to escape the world, but you can't escape the economic realities of that world, regardless of if you are trading oil, currency, or beans, weiners, and beer. And while I laughed there is an edge to this play, too, as I have had this discussion about conspiracy theories, the Illuminati, the true educational value of the internet, and designing a new constitution with real people who share beliefs similar to Teevo's. As I sat there I began to wonder how many of those real people are stockpiling boxes of canned beans in their basement, and decided right then and there that I wouldn't be accepting any invitations to come and "see" their nuclear fallout bunker. Michael played Teevo delightfully well, a rabidly neurotic, frothing-at-the-mouth individual who is as flawed as everyone else and just as deluded, but who thinks he alone has access to the truth. Ian as Darrell is a wonderful foil to Teevo's neurosis, just a solid, steady guy who likes Teevo and is very tolerant of his paranoia but who seems a bit naive about exactly how far it goes. Darrell and Teevo bounce off each other like billiard balls, and it was terrific to sit and enjoy their friendship-with-a-twist. Now, those first two plays were easy enough to enjoy because I could hear them. I was sitting very close to the stage for "The Wall", and "Mac Attack" was so boisterously acted that I think you could likely have heard them from outside the tent. Sadly, this was not true for the last play, and I am deeply disappointed - because I suspect it was quite lovely. The last play was one called "Dried Roses", written by Michelle Cormier, and starring Ian Stockley and Chantal Ireland. It is about a couple who have come to a point in their marriage where they need to decide whether to hold on or let go, and I was intrigued by the premise. You see, I've been married for a very long time (25 years this December, and yes, I was barely out of infancy when we wed, thanks for asking! ), and I think all marriages suffer these kinds of crises. It's a difficult topic, and it's a moving one - and I suspect it was quite lovely, as what I could get from the play seemed to touch on so many different emotions and aspects of that situation. The truly troubling part, though, was that I could barely hear a damn thing. The noise from the fans, the live music, the patrons drinking at the back of the tent, and the snowmobiles drowned out the soft and gentle voices of the actors. And I don't blame the actors, it's not like you can shout a play like that and have the same effect, but it was so profoundly frustrating to sit there and see what you strongly suspect was a beautiful and haunting story acted out in front of you and not be able to hear it. And that, people, is my only complaint about my last day at winterPLAY. Next year they might need to move the tent hosting the plays a bit further away, or even to a different venue - but aside from the noise issue the plays themselves were stunning, and the best part was they shone with local talent, much of it talent I have come to know and adore. For me it was the perfect last day at winterPLAY. I had planned to return on Sunday, the official last day, but that's the day this evil mountain virus hunted me down (and caught me) and I spent that day lying on the sofa moaning softly instead. So. winterPLAY 2012, people. I missed some of it, and I saw some of it. I loved every single event I attended, and the only thing that worried me was the fact that there were so few people at some events. I think those who showed up for the events knew they were experiencing something special, something out of the Fort Mac norm (especially the cultural events like the African guitars and Cassius Khan, both receiving rave reviews from those who saw them). I think there is always a risk in things like this - expanding the festival to more days, very different events, events not typical for what you have seen here in the past - and yet the risk was worth it, too. 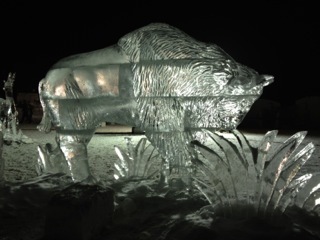 I know David Whitelock, Executive Director of Events Wood Buffalo, and his crackerjack team of event professionals went out on a limb with this. I know they poured their heart and soul and energy and time and every waking hour (and some they should have been sleeping) into this. I know that at times they must have wondered if they were crazy to try this, and at times they must have worried. I saw David Whitelock that final day I spent at winterPLAY. I gave him a hug (he's become one of my favourite people, too, as he has embraced the community so quickly and so easily - how can you not love him? ), and told him that whatever did or didn't work this year at winterPLAY he needs to take the long-term view. He and his team took a risk, and in my eyes it paid off - and it will pay off next year, and the year after that, and the year after that. How? Because like that old shampoo commercial I will tell some friends about the great time I had this year at John Mann and at the opening ceremony fireworks and at the plays and at Champloo. My guest blogger will tell her friends about her great time at Bif Naked and the Canada DJ's and the burlesque. And every other person who attended every other single event will, too, until the entire community is buzzing with how great it was and leaving people wondering why they didn't go, how they could have missed such an amazing event. And next year they will go. Next year there will be sold-out shows and not an empty seat at a single event. I'm telling you now, people. Next year get your tickets early for winterPLAY - because with this blog I'm telling a few friends all about it, and you all know what happens in that shampoo commercial. for an AMAZING winterPLAY 2012!